What is employment verification form? 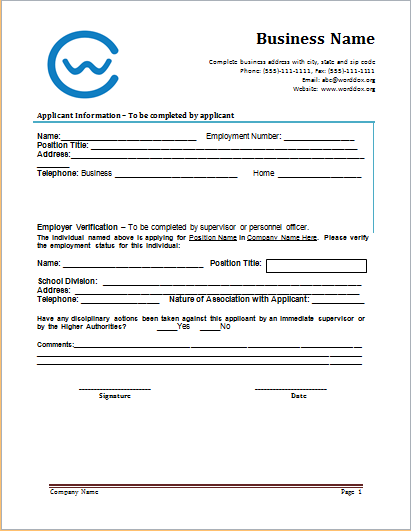 You might be aware of the need to have an employment verification form if you are employed somewhere or running a business. It is a document that provides a crux of the employment history or verifies your affiliation with a certain employment. These types of documents are necessary to avoid frauds related to paying taxes or fabricating one’s association with a certain firm. At times, complete details about the work along with the account details are mentioned in the form for a thorough check up. There have been some instances in which the people do not seem to share accurate details about themselves. They hide their identities and even do not inform others about their specific jobs or clarify if they are businessmen. This becomes an issue when someone has to pay his taxes and his financial details are required. So, many organizations or court of law ask for the verification of your particular employment in order to impose taxes accordingly. There are certain details which if not added in the form make it useless. These things include the date of employment along the with the salary package that is a part of the specific job. Any such contract that has been formulated and is among the employer or the employee also has to be mentioned here. By giving your personal details as well as salary account details, you can accurately fill this specific form.